Join up to 250 fellow RV enthusiasts for a variety of seminar sessions on topics ranging from how to get started RVing & Minimalist Travels to Finding Jobs on the Road, Healthcare for RVers, Budgeting for RV Life and much, much more! 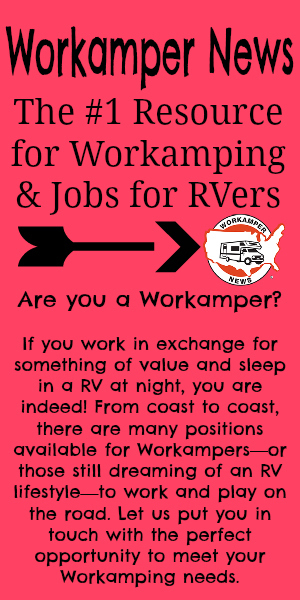 Visit the Job Fair & Vendor Market Friday morning to meet with Workamping Employers and RV Vendors. Speak with employers about their program details, find out how to apply or just drop off your resume! Some employers will be recruiting on-site! RV vendors will also be on-site to speak with attendees regarding their products and services. Use this time to get details and information or just do a little shopping! Dive deeper into topics of your choice, in a variety of both Free & Paid Presenter-led Workshops on Friday, October 25th. These small session workshops are a great way to get specific details, guidance, and more personal information on your favorite topics. Make plans to stay for the full week and take part in the fun pre-event Rally! The Rally is free to attend for all participants and will offer group activities on Saturday &Sunday! Come hang out with our Rally Hosts, meet new friends and have some fun before the main event.